The World Map | Rollespræll! The World Map was finished in 2009, eleven years after our campaign had started. 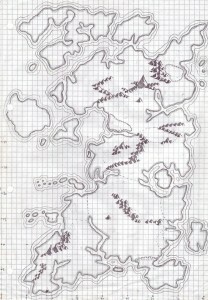 Until then, I had used various hand drawn maps on paper, but I made sure to scale them correctly so that they one day could be used to help finish the map. But I had a general idea of how the world would look already in 1998, and it looked something like the sketch to the left. With that basis, more detailed maps of areas of the world were made for years until I sat down in 2009 and glued it all together with photoshop. And today, most of the world have been mapped out (although some places remain largely unexplored, such as Niflheim and the area West of it, The Frozen Sea and pretty much all islands surrounding the continent). After the players managed to stop a great war, some of the map was changed as well, but that doesn’t show on our map yet. The players were given reign over huge territories North of Punicus Republic and created kingdoms for themselves, even though promptly leaving both those and the world itself for more glorious adventures elsewhere. In addition to a 1600X2058 map of the world on the bottom of the page (just right-click it and show image), you can find a 6464×8313 map on my Deviantart page. 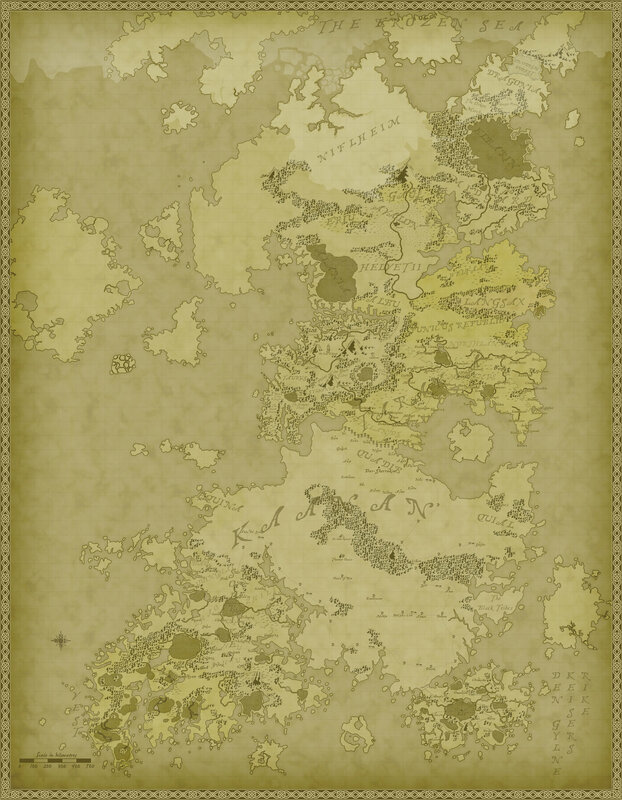 There is also a pdf available for downloading if you want to print the map into a gigantic poster. The pdf is 69 Mb, and can be located here.